Pignatta, D., Bell, G. W. and Gehring, M. (2015). Whole Genome Bisulfite Sequencing and DNA Methylation Analysis from Plant Tissue. Bio-protocol 5(4): e1407. DOI: 10.21769/BioProtoc.1407. This protocol describes whole genome bisulfite-sequencing library preparation from plant tissue and subsequent data analysis. Allele-specific methylation analysis and genome-wide identification of differentially methylated regions are additional features of the analysis procedure. Note: Other bisulfite conversion kits can be used, but were not tested in this protocol. Tip: It is important to use fresh 80% ethanol for Ampure bead purification. Shake the Agencourt AMPure XP bottle to resuspend beads. 180 µl of beads will be needed per sample (ratio of 1.4:1 beads to DNA). Keep at room temperature. Fill tank with deionized water to 12.5 on the graduate fill line label. Turn on the machine, the chiller (set temperature at +3 °C), and the computer. Launch the application software (Covaris SonoLab 7). Push the degas button. Degas the instrument for at least 30 min before use. Settings: Peak power 175 W, duty factor 10, cycles/burst 200, time 6 min, temperature 6 °C. Note that the temperature rises while the machine is in use, which could interfere with the shearing cycle. Thus, the machine is initially set to 3 °C as a precaution. Transfer 130 µl of DNA sample (~10 ng/µl) into the Covaris microTUBE, spin down briefly and proceed with shearing. Run 1.2% gel with sheared DNA (250 ng) and un-sheared DNA side by side to evaluate shearing. Samples can also be run on a Bioanalyzer. Expected size range is 100-300 bp. See representative data Figure 1. Place the tube into Covaris microTUBE Prep Station and remove the cap. Transfer the 130 µl of sample to a low-DNA binding microfuge tube. Add 180 µl of resuspended beads and mix well by pipetting. Place the tube onto the magnetic stand for 2 min to separate beads from the solution. Aspirate the cleared solution from the tube and discard. Do not disturb the beads. Dispense 250 μl of 80% ethanol to the tube and incubate for 30 sec at room temperature. Aspirate the ethanol and discard. Repeat for a total of two washes. Let the beads air dry for 5 min. Tip: Be careful not to over-dry the beads (bead pellet appears cracked if over-dried) as this will significantly decrease elution efficiency. Remove the microfuge tube from the magnetic stand. Add 52 μl of water to the beads and resuspend the beads by pipetting 10 times. Incubate for 2 min at room temperature. Place the tube back on the magnetic stand. Transfer 50 µl of the clear supernatant to a new PCR tube without disturbing the beads. Preheat thermocycler to 30 °C. 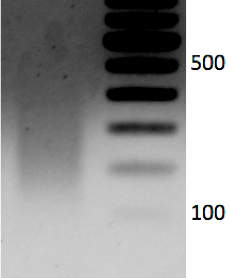 Add 10 µl of Resuspension Buffer and 40 µl End Repair Mix to the sheared DNA from step C9. Adjust pipette to 50 µl then gently pipette the entire volume up and down 10 times. Incubate for 30 min at 30 °C. Vortex the AMPure beads until they are well dispersed. Prepare a diluted bead mixture by combining 125 µl beads with 35 µl of PCR grade water. Add the entire volume from step D4 (100 µl) to 160 µl of the diluted beads. Adjust pipette to 200 µl then gently pipette the entire volume up and down 10 times. Place the tube on the magnetic stand for 5 min. Remove and discard the supernatant from each tube without disturbing the beads. With the tube on the magnetic stand, add 200 µl of freshly prepared 80% ethanol without disturbing the beads. Incubate 30 sec. Remove and discard all the supernatant from each tube without disturbing the beads. Repeat ethanol wash once. Let the tube stand at RT to dry for 5-8 min. Remove the tube from the stand and resuspend the dried pellet with 17.5 µl Resuspension Buffer from the Illumina TruSeq kit. Gently pipette the entire volume up and down 10 times to mix thoroughly. Incubate the tube at RT for 2 min. Place the tube on the magnetic stand at RT for 3 min. Transfer 15 µl of the clear supernatant to a new PCR tube without disturbing the beads. SAFE STOPPING POINT DNA can be stored at -20 °C for up to 7 days. Remove the A tailing mix from -20 °C and thaw at RT. Preheat thermal cycler at 37 °C. Add 2.5 µl of Resuspension buffer and 12.5 µl of A tailing mix to the tube from step E13. Adjust pipette to 30 µl, then gently pipette the entire volume up and down 10 times. Immediately proceed to adapter ligation. Illumina TruSeq DNA adapters, which contain 5-methylcytosines instead of cytosines, are ligated in a 50 μl reaction. Remove the Adapter Index tubes from -20 °C and thaw at RT. Combine sample and reagents as indicated. Incubate overnight at 16 °C. Add 42.5 µl of the beads to the sample. Adjust pipette to 85 µl then gently pipette the entire volume up and down 10 times. Remove and discard 80 µl of supernatant from each tube. Let the tube stand at RT to dry for 8 min. Remove the tube from the stand and resuspend the dried pellet with 22.5 µl Resuspension Buffer. Gently pipette the entire volume up and down 10 times to mix thoroughly. Incubate at RT for 2 min. Place the tube on the magnetic stand at RT for 5 min. Transfer 20 of µl of the clear supernatant to new tube without disturbing the beads. SAFE STOPPING POINT. DNA can be stored at -20 °C for up to 7 days. Use the MethylCode™ Bisulfite Conversion Kit Invitrogen following the manufacturer’s protocol. Elute bisulfite-treated DNA in 10 µl. Use 3 µl (from step I2) as a template in each of two PCR reactions. *Keep the number of cycles as low as possible to reduce PCR duplicates. Add 50 µl of beads to the sample. Let the tube stand at RT to dry for 8 min. Remove the tube from the stand and resuspend the dried pellet with 16 µl water. Gently pipette the entire volume up and down 10 times to mix thoroughly. Incubate at RT for 2 min. Transfer 15 of µl of the clear supernatant to new tube without disturbing the beads. Subject libraries to quality control on a Bioanalyzer before sequencing. Libraries should have a size range between 250 and 400 bp and the adapter dimer peak, if present, should be less than 10% of the library. See Figure 2 in representative data. Clone 1-2 µl into TOPO Blunt and sequence a few clones to check that the adapters are ligated as expected. Bisulfite conversion checkpoint: In plants, the chloroplast genome is expected to be unmethylated. Amplify chloroplast DNA from the library by PCR. Clone into TOPO TA cloning kit following manufacturer’s protocol and sequence by standard Sanger sequencing. Each C in the amplified PCR product should be converted and sequenced as a T.
Sequence library (~10 pM) on Illumina HiSeq 2500 machine. Paired end or 80 bp single end reads allow for better mapping to the genome, but standard 40 bp single end reads are also acceptable. Sequencing depth needed depends on the size of the genome and can be calculated using the Lander/Waterman equation. Please refer to http://support.illumina.com/downloads/sequencing_coverage_calculator.html for more details. Note: For all the scripts used in the Procedure, please download here. Copy sequencing reads to desired location on local computer or server. Unzip and untar sequence files if needed. Run quality control of sequencing reads with fastqc (http://hannonlab.cshl.edu/fastx_toolkit/). Examine the fastqc report to determine if/how to filter and/or trim reads. Discard adapters and low quality reads (less than 75% quality scores above 25) if necessary. Re-run quality control to check final quality of the reads. Align the reads to the reference genome of your choice using Bismark (Krueger and Andrews, 2011). We strongly encourage the reader to consult the review written by the authors of Bismark (http://www.ncbi.nlm.nih.gov/pubmed/22290186) before starting the data analysis. Here, we describe alignment of single end reads, but alignment of paired end reads is also possible. Prepare bisulfite-treated genome for future mapping (only needs to be done once). Map BS-reads to converted genome (map forward and reverse reads separately). From this point onwards the analysis follows different steps based on the genotype of the sample used to prepare the library. Using a sorted SAM file, keep only one sequence per strand that maps to the same start and end position. This eliminates PCR duplicates. A log file (SAM_redundancy_stats.log.txt) of counts for each read is created. Sorts them by decreasing prevalence and then by increasing number of mismatches (not counting bisulfite conversions) to the genome. The most prevalent read with the total highest quality string is kept. In the case of a tie, the read with the fewest number of mismatches is retained. In the case of another tie, it prints out every unique read. Run Bismark’s supplementary script “bismark_methylation_extractor” on sorted SAM files. The mean bisulfite conversion rate for each library is calculated based on the methylation status of each cytosine from reads mapping to the chloroplast genome, which is expected to be unmethylated. Get info about methylation status of each nucleotide from each read mapping to the chloroplast. The output file contains the conversion at each position, and the mean C conversion across the chloroplast is printed to the screen. In the case of F1 hybrid libraries, two parental genomes may be available as reference. You may decide to map reads to both the parental genomes to maximize the number of mapped reads using Bismark as described above. To do that, first map all the reads to the best reference genome, then align the “unmapped” reads to the other genome. Make file of unmapped reads from the fastq file (e.g., reads not in SAM file). To assign reads to a particular strain and to retain as many unique reads as possible, separate the reads by strand. Classify the forward reads according to their parent-of-origin with a bedfile where the C>T SNPs between the two genomes of interest are ignored but all other SNPs are retained, and classify the reverse reads with a bedfile where the G>A SNPs between the two genomes of interest are ignored but all other SNPs are retained. There is only one bedfile, but read strand has to be specified (pos or neg). Usage: classify_bismark_reads_by_parent.one_strand.pl file_name_bismark.pos.sam SNPs.bed pos > file_name_bismark.pos_class.sam"
Usage: classify_bismark_reads_by_parent.one_strand.pl file_name_bismark.neg.sam SNPs.bed neg > file_name_bismark.neg_class.sam"
Reads are classified based on their sequence at known SNP positions. After classification, redundant reads from each class are eliminated. You may delete the individual pos and neg files after checking the size of the combined files. Run methylation extractor for each set of classified reads as well as for all reads combined. Combine all the nr.sam files into an “allreads_nr.sam” file with cat command and run methylation_extractor again. For each class, organize the 12 methylation extractor files in the output files folder. Divide the genome into 300 nt (windowWidth) windows, overlapping by 100 nt (windowOverlap). Summarize_by_window.sh features: This script summarizes methylation status across overlapping genomic windows of defined size by converting the processed Bismark methylation extractor output files into a set of bed files and determining weighted methylation values as described in Schultz et al. (2012). Bedgraph files for viewing in a genome browser are created in the bedgraph folder. Bismark's methylation extractor output by chr position (after sorting) is summarized by converting the methylation string into ummethylated counts, methylated counts, and percent methylation, producing output in BED-like format (scorePerPos folder). The folder weighted_summaries_by_window has three bed files, which merge sites across each window. For each window it provides counts and weighted percent methylation. At least 5-read coverage at each site is required. Differential methylation is assayed by calculating the difference between samples (sample A-sample B of weighted methylation fractions), and confidence (p-value from Fisher's exact test) for each window in all sequence contexts is assigned. P values are corrected with the Benjamini and Hochberg False Discovery Rate (FDR). CG and CHG DMRs were defined as regions with a minimum overlap of 3 informative Cs between windows and, for example, a weighted methylation difference of at least 35 and a corrected p value < 0.01. CHH DMRs were defined as windows with a minimum 10 overlapping informative cytosines and, for example, a weighted methylation difference of at least 10 and a p value < 0.01. The user can use their own criteria for defining DMRs. Make matrix of counts for 2 samples, each in 2 contexts using files in the 'weighted_summaries_by_window' folders. Compare counts across two samples in the same context. For each window, the output file will have (a) the raw Fisher's exact test p-value reflecting whether the fraction of meth/unmeth counts is the same for both samples, and (b) the difference (sample A-sample B) in weighted methylation fraction. Methylation fractions appear next to the results of each statistical calculation. Open the stats file in Excel and sort based on p value. with a methylation difference above your threshold (e.g. 35%)] into another file and delete all but the desired 5 columns (chr, start, end, difference, FDR value). Save the file with the extension “bed” and intersect with genomic features using Bedtools (Quinlan and Hall, 2010). Figure 1. 1.2% gel with sheared DNA (250 ng). Expected size range is 100-300 bp. Figure 2. Bioanalyzer results. Libraries with higher concentration perform better in Illumina sequencing. Bioanalyzer analysis of libraries before sequencing is an important quality control step. Both libraries were in the expected size range (as indicated by blue bracket in panel A) and therefore suitable for sequencing. Library 1 (with higher molarity) was subjected to an additional clean up step using AMPure XP beads in order to reduce the amount of residual adapters (indicated by a red arrow in panel A, and panel B). Library 2 (panel C) was not cleaned up because it was at a low concentration and additional clean up might have caused loss of enough library such that sequencing would not be possible. Sequencing resulted in 12,489,378 and 3,824,500 total non-redundant reads for library 1 and 2, respectively. This work was supported by the NSF (MCB 1121952) and an award to MG from The Pew Charitable Trust’s Pew Scholars Program in the Biomedical Sciences. This protocol was adapted from Pignatta et al. (2014). Groszmann, M., Greaves, I. K., Albertyn, Z. I., Scofield, G. N., Peacock, W. J. and Dennis, E. S. (2011). Changes in 24-nt siRNA levels in Arabidopsis hybrids suggest an epigenetic contribution to hybrid vigor. Proc Natl Acad Sci U S A 108(6): 2617-2622. Krueger, F. and Andrews, S. R. (2011). Bismark: a flexible aligner and methylation caller for Bisulfite-Seq applications. Bioinformatics 27(11): 1571-1572. Li, H., Handsaker, B., Wysoker, A., Fennell, T., Ruan, J., Homer, N., Marth, G., Abecasis, G. and Durbin, R. (2009). 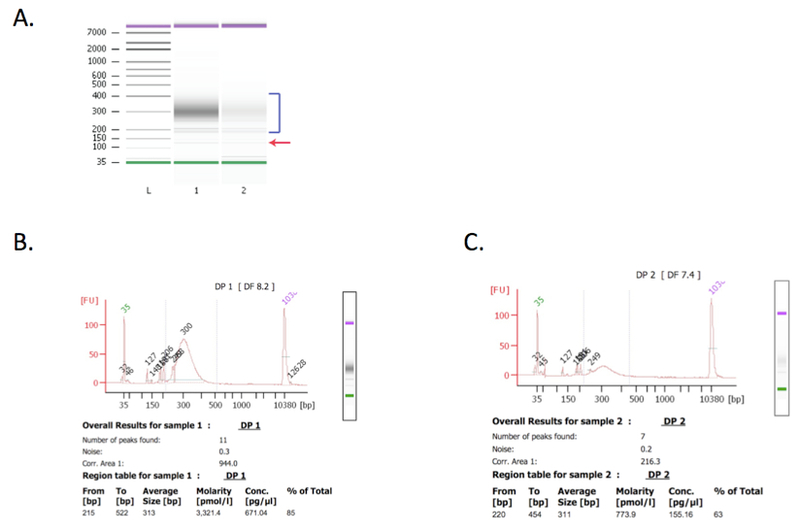 The sequence alignment/map format and SAMtools. Bioinformatics 25(16): 2078-2079. Schultz, M. D., Schmitz, R. J. and Ecker, J. R. (2012). 'Leveling' the playing field for analyses of single-base resolution DNA methylomes. Trends Genet 28(12): 583-585. Copyright Pignatta et al. This article is distributed under the terms of the Creative Commons Attribution License (CC BY 4.0).